GM Aravindh Chithambaram of Tamil Nadu and IM Arghyadip Das of Railways posted wins to join the lead with grandmasters SL Narayanan of Kerala and MR Lalith Babu of PSPB at the end of the 3rd round of the Khadi India 55th National Premier Chess Championship, organised by All Bihar Chess Association at Lemontree Premier Hotel, Patna today. Each player has two points to his credit. While Aravindh subdued GM RR Laxman of Railways in a marathon struggle, Arghyadip shocked the hitherto co-leader Deepan Chakkravarthy of Railways. Tamil Nadu’s young grandmaster Aravindh Chithambaram cracked the Berlin wall (which was frequently played by Magnus Carlsen and Vishy Anand in their World Championship match at Chennai in 2013) created by Laxman patiently. The middle game was dominated by Laxman’s attacking moves and Aravindh sacrificed a pawn for counterplay. RR Laxman had one hour against just more than a minute to Aravindh at one time. In the end game, Aravindh proved that his knight was superior to Laxman’s light coloured bishop and his progress was slow and steady. When his f- pawn started to roll with the assistance from his queen, Laxman resigned after 95 hectic moves. International master Arghyadip Das from Kolkata carved out a beautiful win over the champion of National Challengers Deepan Chakkravarthy. In the Petrov’s defence adopted by the former, Deepan unnecessarily sacrificed a pawn on 25th move for no favour in return. After controlling the open c- file Arghyadip forced Deepan to give up his queen for two rooks and a pawn. Deepan’s incorrect g3 move on the 34th turn helped Arghyadip to win the exchange and also the game one move later. The decline to the offer of the queen exchange on 20th move by the national champion Karthikeyan Murali of Tamil Nadu resulted in the loss of a pawn against Sammed Jaykumar Shetty of Maharashtra in a game arising out of Giuoco Piano opening. Though he managed to recover the pawn later, Karthikeyan was trailing throughout the game. Surprisingly, Sammed agreed to a draw after 28 moves in a clearly better position. 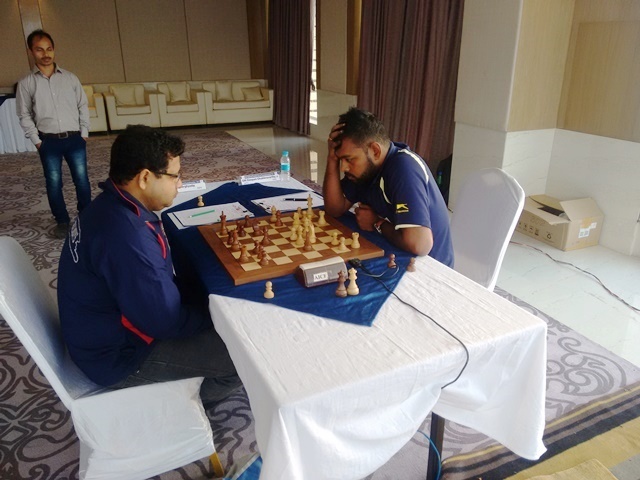 The Queens Indian defence game between the Kerala youngster Sunilduth Lyna Narayanan and GM Debashis Das of Odisha petered out into a draw after 31 moves. Though it was the same colour bishop ending apart from the queen and 5 pawns to each player, the similar pattern of pawn structure on both sides yielded no decisive result. 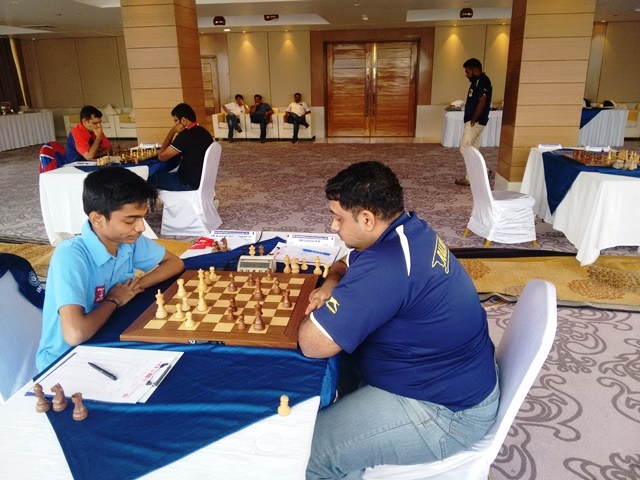 After a loss in the second round, GM Swapnil Dhopade of Railways had to return home with a draw against GM Abhijit Kunte of PSPB out of a Catalan opening. Swapnil with white was clearly better going into the middlegame and had a huse time advantage on the clock. But it looks like he lost the thread in the late middlegame and had to scale back his hopes of winning. Swapnil needs to get back into his usual self quickly and this being a long tournament, he still has plenty of chances to make a comeback. Himanshu Sharma played purposefully with black and had the initiative but the game too petered out to a draw. The French defence employed by former under 17 national champion IM Shyaamnikhil P of Railways against his ICF colleague S Nitin also ended in a draw in 25 moves.